​Well 2016, we are six months in and I don’t care much for you so far. You have certainly thrown a lot of curve balls and offered up a lot of obstacles. I have managed to trudge through it all, sometimes laughing, sometimes crying, but generally feeling a bit bruised and battered along the way. Even the good stuff has come with rough patches. You’ve taken away several friends and colleagues, suddenly, and long before their time. Many friends have lost their parents. You have definitely made loss and mourning felt prevalently. It has hit very close to home how short life can be. This has made me very reflective and I have spent a lot of time thinking about how to make the most of it. Examining where I am at versus where I really would like to be. Looking closely at the things I love and that make me happy, and in turn identifying the things that no longer work. Strategizing about how to eliminate the things that are weighing me down and placing more emphasis on the things that help lift me up. Somehow I feel like this should be easier – but it isn’t. There have been things I have truly enjoyed. I finally faced my fear of putting my own creative writing out there for public consumption by taking on the A to Z Blogging Challenge. I liked it, I had fun with it – I would like to continue to explore this avenue and find more outlets for it. Then there was Ireland, an amazing, brief escape. Reinforcing once again how much I love to travel and meet other people and explore other cultures. But you couldn’t see fit to allow me to have these moments of joy without bringing me to my knees. So what gives, 2016? I know there are messages here for me. I get it. I’m listening. I’m trying. Could you ease up over the next six and let some things blossom? I would really love a bit more cooperation and fewer speed bumps. So here’s to a brighter, cheerier second half – may we reach the end with smiles and goals achieved. Happy first day of spring! For me spring is like pushing the reset button. This year I feel like I need that more than in the past. I did not enjoy this winter at all, not even a little bit. I felt cooped up and cranky the majority of the time. There was hardly any snow – the least snowy winter in a long time. I think that was a part of my doldrums – I love snow, there is a magical beauty in snow. There was no beauty in this winter. It was dark, gray, bleak. This winter I learned how much I crave sunlight. The best thing I can say about the winter is it wasn’t very cold. So after four months of a complete and total lack of energy or interest in much of anything, I’m hoping to start feeling more re-energized. The days are longer again. There is more sunshine! It feels really good too. Now that there is still daylight when I get home from work I can get out and start walking again, get some fresh air. I can open the windows and air out the house. That is always a welcome relief and the cats love it too. They run from window to window, noses up in the air, letting the breeze blow their whiskers, with their ears pricked forward listening to all the birds. Ahhh, the birds, it is so lovely to be able to hear all the different calls again. All of the animals are starting to perk up as well. The squirrels have a little extra zip; the chipmunks are running around the yard; and there was even a big old opossum wandering around the yard one night. Although it is still very gray, there are signs of life all around. The lilacs have buds on them, the irises are poking up, and soon things will be greening up. So I can be a little more patient, and watch as the beauty slowly makes its way back, and in doing so renews my spirit as well. From the onset of the modern day Olympics art and sport were believed to be a perfect marriage. The heart and soul of the Games is to foster and encourage the synchronization of the body and the mind. Art inspires sport and sport inspires art. As a result of this belief, the early history of the Olympic Games featured competition in the arts as well as sports. Events included architecture, sculpture, painting, literature, and music. Winners of these events were also awarded gold, silver, and bronze medals. The goal of the Cultural Olympiad is to focus on the harmonies between culture and sport and to exemplify the values of the Games: friendship, respect, and excellence. While artistic endeavors are no longer contested for medals, culture and art continue to play a prominent role. This is most evident in the Opening and Closing Ceremonies. However, exhibits and performances serve as precursors to the games and occur throughout the region at the various venues during the Games. In the 2016 Rio Games this cultural event is called Celebra. It will feature six areas of artistic creation: literature, popular art, music, performing arts, visual arts, and dance. Celebra begins in April and runs through September. Innovators are being challenged to focus on the cultural diversity of Brazil by designing events encouraging audience participation, humanizing public spaces, and bringing inspiration to every day life. All Celebra events are free to the public. The list of events that will make up Celebra has not yet been made public, however below are some highlights of Brazilian culture that may become prominent themes. Machado de Assis regarded by many as the greatest writer of Brazilian literature. One of his most noted works, Posthumous Memoirs of Brás Cubas, is the tale of a politician and writer as told by himself after his death. Paul Coelho, one of the best-selling Brazilian authors. He penned The Alchemist, the story of a shepherd who goes on a journey searching for treasure and finds himself. Adriana Lisboa, a popular modern Brazilian author. Her work is recently receiving rave reviews in the United States since being translated into English. Crow Blue tells the story of a young girl, who suffers the loss of her mother at thirteen, and sets off to retrace her mothers travels through Brazil and the United States in search of her biological father. Brazilian cuisine, such as: caipirinha (k-eye-per-reen-yah) Brazil’s national cocktail made from fermented sugarcane juice; acarajé (a-ka-ra-zjeh) a deep-fried patty of black-eyed peas and onions stuffed with shrimp, nuts, and other ingredients; and feijoada (fay-zwah-da) a stew made of black beans, sausage, and pork. Tapestries of flowers, a tradition that began with Easter celebrations. Streets are covered in a base of sand or sawdust and elaborate designs are arranged on top with flowers, seeds, stones, and other organic materials. Traditional Brazilian festivals, the most well-known being Carnivale which is famous for its parades and the Bumba-Meu-Boi festival which features a dance using bulls made of wire frames to tell the story of a bull that was killed and brought back to life through healers and music. Music: Brazilian music has its origins in African, Portuguese, and European styles. The music is full of passion and energy and is a very integral part of the Brazilian lifestyle. Bossa Nova is probably the most recognized. It is a blend of samba and jazz that became popular in the 1950s. The song most identified with it is The Girl from Ipanema. Brazilian Popular Music emerged in the late 1960s. It is a blend of styles: bossa nova, folk, rock, jazz, and samba. This is the most popular music listened to today. Choro is an instrumental style featuring flute, guitar, and chordophone. It originated in Rio in the 1800s. Sandra Cinto, a Brazilian painter and sculptor whose work has an ethereal, otherworldly quality to it. Much of her work encompasses landscapes and seascapes. Fernanda Montenegro, the first Brazilian actor nominated for an Academy Award for Best Actress for her work in Central Station. Sebastiao Salgado, one of the leading contemporary documentary photographers today, his work encompasses the history of Brazil and ecological topics and Felipe Dana, a photojournalist, whose work studies the impact major events, such as the Olympics and World Cup, has had on Brazilian society. Dance: Brazilian dance, like it’s music, has its roots in African, Portuguese, and European styles. These dances exhibit soulfulness, sensuality, and passion. Samba (from semba meaning the invitation of a man to a woman to dance) is the best known. It is an African dance that was once banned for being too lewd. Carimbo (meaning drum) is a sensual dance in which the women often use a scarf or skirt as part of the movement. The Lambdada (meaning slap or hit) is a more modern form in which the body movements resemble waves. Forro (from forrobodo meaning a great party) is one of the most popular. It is usually danced with a partner in synchronization integrating often-complex steps. Performing Arts: This category will likely be a blend of many of the aspects of all the others above. The goal is to bring these artistic endeavors to common spaces throughout Rio and Brazil; to bus stations, cafes, parks, open public spaces, trains, and boats just to name a few. The impact of the cultural events has long reaching outcomes for the host country. Brazil has center stage in the months leading up to the Games and a worldwide audience for the two weeks while the Games are played. For many host countries, these events herald a boost in tourism and in doing so also boost local economies. Check back monthly for more Olympic updates and commentary as I countdown to Rio 2016! For information on all things Olympic in Rio 2016 visit http://www.rio2016.com/en. To follow Team USA visit http://www.teamusa.org/. The International Olympic Committee was formed in 1894 and gave birth to the modern day Olympics. The first of the modern games was held in 1896 in Athens, the same location where it all began in ancient Greece. The games have now been played for more than a decade! For me the Olympic Games is the ultimate sporting competition. The best of the best from all over the world come together to try and win what I think is the most valued prize in sports; Olympic Gold. Heck even taking the Silver and Bronze medals is pretty spectacular. Athletes have the potential to go home one of the top three in the world representing their sport. When the games began, to be eligible to compete athletes were required to be amateurs. To maintain amateur status meant athletes were not allowed to make money from sports. For many decades this was strictly enforced. If an athlete was found to have accepted money or commercial endorsements he or she was banned from competition in the games. In fact one of the United States most revered athletes, Jim Thorpe, who won Olympic Gold in the pentathlon and decathlon at the 1912 Stockholm games, was stripped of his medals when it came to light that he played two seasons of semi-professional baseball before competing in the Olympics*. The spirit of the Olympics - sportsmanship along with the love of sport was the driving force behind the Olympic movement and was held in high esteem. It was long thought that monetization of the events and the athletes would degrade the core qualities that the Olympics embodied: friendship, solidarity, and fair play. The degradation of the Olympics as a truly amateur athletic competition seemed to begin when countries began government sponsorship of their athletes. It was felt government-sponsored athletes were in essence professional athletes, so a precedent for allowing professional athletes to compete was already being set. Then came television and ever increasing media coverage of the games. The popularity of the viewership was an advertiser’s dream. Between politics and the plethora of money that could be made from the games, and the athletes participating in them, it wasn’t long before the IOC began rethinking the amateur rule. In 1986 the amateur rule was abolished and professional athletes have been participating in the games ever since. One of the first forays of Team USA into sending professional athletes is the 1992 Dream Team. Just three of the players named to the team, Michael Jordan, Magic Johnson, and Larry Bird, had already earned among them: 10 NBA championship wins, 7 NBA Finals MVPs, and 8 regular season MVPs prior to the games. Add Scottie Pipen, Charles Barkley, John Stockton, Karl Malone, Patrick Ewing, Chris Mullen, David Robinson, Clyde Drexler, and Christian Laettner and this was a powerhouse team. They averaged 8 years of playing professional basketball. Jordan, Ewing, and Mullen had already earned Olympic Gold at the 1984 games (all college players at the time). Yes, seeing all of this talent play together on one team had an extreme cool factor. It was an exciting prospect. But was it the right team to send to an Olympic Games? They trained as a team for six days, two hours a day, twelve whole hours worth of effort as a team. They also played some exhibition games. If it took so little effort on their part to prepare how is this fair play? They didn’t stay in the Olympic Village during the games; one of the reasons cited being security concerns. How did this promote friendship and solidarity? They won the gold medal by beating Croatia by 32 points. Is that supposed to garner national pride? Were they an amazing team? Yes. Did their presence at the games elevate the sport worldwide? Yes. Did they really embody what the Olympic Games are all about? I don’t think so. Another factor that has impacted the trend toward professional athletes participation is the ability of many athletes to stay in it longer and still be competitive. While I support and admire their ability to do so, and while I would love for them to stay active and competitive in their sports, I don’t think they should continue to compete in the Olympic Games. I love watching Michael Phelps swim. What he has accomplished, 22 medals (18 of them gold) in three Olympic Games, is phenomenal. He likely will compete in his fourth Olympics in Rio. I’m just not sure I want him to. Yes he could win more medals and break more records; he’s exciting to watch and he will bring in lots of money. But when is enough, enough? How many talented swimmers lost their opportunity to shine because he wouldn’t step aside? Will gold number 19 be as sweet as the first? The professionalization of the Olympics has long been debated and I doubt there will ever again be an Olympic Games without professional athletes. I wish, however, that it had remained purely an amateur event. I believe this is what made it special and unique, the ideal of sport for the love of sport. Don’t misunderstand, I have no problem with athletes getting endorsements and winning money or being paid for what they do. They work and train damn hard. They are truly talented and deserve to be recognized for their talent. I don’t believe payment and endorsements should factor into their Olympic eligibility. I do believe there should be some eligibility requirements surrounding the length of time they have been competing and the number of Olympic Games they are allowed to compete in. Perhaps this could be achieved by setting age limits or capping the number of games an individual can participate in. I would love to still see the Olympics as the rise of someone’s career. To come back after four years and defend – that is still exciting to me. To return for a third or fourth – I’d rather someone else have his or her moment. Maybe I’m just a fan of the underdog. I love a great story of triumph against the odds. But will the professionalization of the Olympics ever again produce a Miracle on Ice? I want to see the Jamaican Bobsled Team and Eddie the Eagle compete! I want to see them succeed even if success is just making it to the finish line. I want to see competitors with a fire in their belly to achieve a life long dream. I want magic to happen! *Jim Thorpe’s Olympic titles were restored in 1983, 30 years after his death. Professionals Amateurs I don't care. I am a huge fan of the Olympic Games and we are in an Olympic year. Let’s get the countdown to the Opening ceremonies started! The games will kick off August 5th for the first time in South America. The city of Rio de Janeiro will be hosting the two-week event. One of the aspects of the Olympics I enjoy is the culture incorporated into the ceremonies by the various host countries. Brazil is so rich with customs and tradition this should be a spectacular affair. I look forward to beautiful scenes of mountains and sea along with the vibrant colors I associate with Rio and Carnival. It promises to be a grand celebration and world party! One of the highlights of these games will be the return of two events after long absences: golf and rugby. Golf debuted in the 1900 Paris Olympics. It was held in coordination with the 1900 Exposition Universelle. Due to controversy among the committees of the two events – the Olympic games were poorly planned and executed. The golf event was open to anyone. It is said that some of the competitors just happened to be visiting in Paris and signed up to compete. Many of them were unaware they were even participating in an Olympic Games. Margaret Abbott, an American, won gold in the women’s event making her the first American woman to ever win an Olympic gold medal. The 1904 Olympics in St. Louis featured 74 Americans and three Canadians in the golf event. The gold was won by 46-year old Canadian, George Lyon, and was considered to be a major upset. The 1908 games in London were supposed to host a golf event but disputes over eligibility caused most of the competitors to withdraw and the event was cancelled. Golf will be played as an Olympic event again in Rio after a 112-year absence. Sixty players will compete in both the men’s and women’s event. The top 15 in the world as of July will be eligible. Only 4 players from each country will be permitted from the top 15. The rest will be determined by their world ranking and from that group only two athletes from each country will be eligible. Based upon these requirements it is foreseeable that some of the best US players will not make the cut. Considering the popularity of golf these days, and the number of world-renowned players who will be competing, this should be a very interesting event to watch. Rugby also debuted in the 1900 Paris games, thanks largely to the support of Baron Pierre de Coubertin, founder of the modern Olympics, who was an avid fan of the game. It was played with 15 players on a team with France, Germany, and the UK competing in the inaugural event. France holds the distinction of being the first to win gold in rugby. It would be eight years later before rugby was again to be played in the Olympics in the 1908 London games. Teams were sent invitations to play but only three agreed to participate: England, France, and Australia. France was unable to put a team together in time and withdrew leaving only England and Australia to play with Australia taking the gold. This time 12 years would pass before another Olympic rugby event, the 1920 Antwerp games. Again many teams declined to play (some stating it was too early in the season) or withdrew at the last moment leaving only a US team and a French team to compete. The US team took the gold. At the 1924 Paris games three teams competed: US, France, and Romania. It was a rematch between France and the US team for gold with the US team once again winning over the favorite. Coubertin left the IOC the following year and with him left the support for rugby to participate in the Olympic games. After 92 years, rugby will once again be back in the Olympics at the 2016 Rio games. Throughout the 90’s and into the 21st century rugby has grown and become more organized with more teams active in World Rugby than ever before. It will be played as sevens this time around with 12 national teams competing in both the men’s and women’s events. Since the US men were the last to win Olympic gold in rugby in 1924, they will be the defending gold medalists. With the energy and enthusiasm of the world rugby community this should be a colorful event and I will be looking forward to New Zealand’s Haka as part of the festivities. Today's the day I promised myself I would publish my website. For quite some time I have sensed a lack of creative energy in my life. I felt I needed to do something to reignite that spark. Writing is something I have turned to time and again, whether journaling or playing around with story ideas. I have always had some trepidation about putting my writing out there for other people. It's time for me to get over that; actually I'm way overdue. A few months ago I decided I would give blogging a try and actually pull out some of those story ideas and bring some of them to fruition. I decided a website was the way to go to present my work. So I started to work on creating my space and putting some thoughts into words. The result is what you see here. I didn't reach all my goals in this initial launch. It is very much a work in progress and I hope will become an avenue for me to find my voice and my inner fire once again. It is my hope that folks who venture to the site will find something interesting, something to make them laugh, or even something that will inspire them to try what they have always wanted to do or accomplish. To all who take the time to visit and read my words....Thank You! Every year there seems to be that one toy everyone wants. I remember one year so vividly - I must have been about six or so - all I wanted for Christmas was Baby Tender Love. She was a baby doll that you could feed water from a bottle and she would cry and pee. Nothing else would do. So Christmas morning I opened package after package and I got all sorts of doll accessories - a high chair, clothes, bottles, a carrier, everything you could ever need to take care of a baby doll. Baby Tender Love was nowhere to be found in any box however. I was a very unhappy little girl! As we always did we went to my grandparents house later in the day for Christmas dinner. Grandma, Grandpa, and all my aunts and uncles asked me what I had gotten for Christmas and I told everyone the sad tale that Santa didn't bring me the doll I wanted. It didn't matter that I got a bunch of great gifts - I didn't get the doll. There was nothing anyone could do or say to make me happy. I moped around all day long. My parents probably wanted to disown me. Later in the day it was time for round two of gifts from all the relatives and grandparents. My Grandfather always. played Santa and passed out the gifts to all the kids. He gave me my gift from him and Grandma - I opened it and there she was - Baby Tender Love. Gram and Gramp didn't let me down. I was so excited; I don't think I put her down the rest of the night. I loved that doll! I still have her, all these years later; she is tucked away in a box up in my parent's attic. She will always be special and hold so many dear memories for me. I love Christmas! Ever since I was child, I have watched the Tree Lighting at Rockefeller Center on TV. I always wanted to be there! More particularly, I wanted to be there on my birthday! Last year I finally got to cross that off my Bucket List. So as I sit here, cuddled up under a blanket, watching on TV this year, I am reflecting back on what was one of the best birthday celebrations ever! Two very good friends, Nicole and Sandy, helped make my wish a reality. We took the train down to the city sipping mimosas on the way. I was given a "Happy Birthday" tiara, which I happily donned all day long. When we got to the city we kicked the adventure off with lunch at the Bryant Park Grill, one of my favs. I love the Bryant Park Holiday Market so we spent some time wandering there and watching some folks skate at the rink. Then it was off to stroll down 5th Avenue and take in all the store windows and holiday decorations. My favorite was Lord and Taylor's scenes from an Enchanted Mansion, complete with a library filled with mischievous mice. 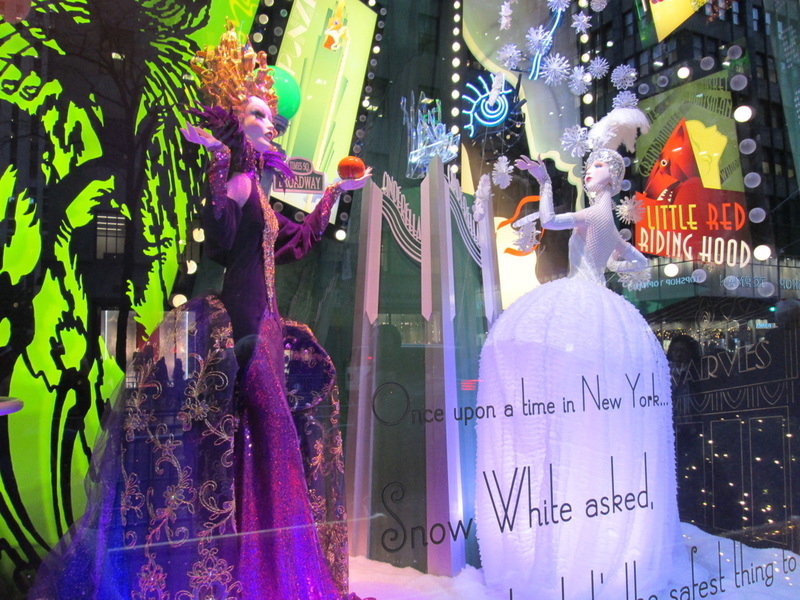 A very close second was Saks with Art Deco inspired Fairy Tales, of course my alter ego, Snow White, made an appearance. Visiting Santa at Macy's Santaland was a must! That was our next stop. Despite Nicole thinking the elves were freaky and "just not right," (they were just very happy), we got an audience with the big guy in red. I wasn't prepared for the question: "What do you want for Christmas?" I had no idea what to say! Of course, that was followed up by shopping. Sandy got the buy of the day with an amazing pair of red shoes; perfect for holiday parties. I had to have a birthday cupcake at Magnolia Bakery. The staff noticed us standing in line, and me with my tiara, and they all stopped and sang "Happy Birthday" to me. It was awesome! We were then off to dinner at Johnny Utah's - still recuperating from knee surgery, riding the bull was out of the question. After dinner it was time, the highlight of the adventure, the tree lighting ceremony. We actually got lucky and managed to get much closer to the tree than we thought we would be able to. The entertainment consisted of Lady Gaga and Tony Bennet, Mariah Carey, Cyndi Lauper, LeeAnn Rimes, Darius Rucker, Pentatonix, and Trisha Yearwood, just to name a few. The interesting part of being there in person is that you actually hear more music. Some of the artists do a rehearsal before the actual taping and there is some activity that just never makes it on air. Christmas is my favorite time to be in the city! I loved being there and participating in a wee bit of Christmas magic! It was a wonderful way to spend a birthday and kick off the Christmas season! Thank you Nicole and Sandy! Memories - "Put your hands up!" As I was driving to my grandmother's house today, I went past a house that always brings to mind a night from high school I will never forget. I grew up in a very rural community consisting of lots of farms and wooded areas. There are many backcountry roads and houses are spread far apart. It was on one of these roads where the incident occurred....kind of in the middle of nowhere. I was a cheerleader, and my squad began a tradition of decorating the senior players and coaches houses for Homecoming. We wanted this to be a surprise, so we did the decorating after midnight so they would wake up to it the morning of the big game. This was probably our second or third year of doing this, so by now we figured most people expected it. Well we were wrong about that. There were four of us. We had already done a couple of houses and went to the house of one of the assistant coaches to decorate. The house was one of the only ones on the road; there were no other houses in sight from this location. We parked the car on the road, and innocently began putting up streamers, balloons, and a sign in the trees beside the house. We were trying to be quiet about it, but apparently not quiet enough. Suddenly we hear "Come out with your hands up!" We stopped what we were doing and stood looking at each other. Someone yelled again. We meekly made our way to the front of the house and there on the porch is an older man in his underwear pointing a shotgun at us. Clearly we had woken him up, and he was none too happy. So the four of us are standing there, dressed in jeans and our varsity jackets, hands in the air filled with balloons and streamers, trying to explain to a very angry man what we were doing. I wish I had a picture of this sight, it seems hilarious to me now, but we were scared out of our wits at the time. We were finally able to convince him that we meant no harm and he demanded we leave; which we did without hesitation. We drove away and pulled off the road when we were out of sight of the house. I don't know how long we sat there trying to calm our nerves. I know my heart was pounding and I was shaking like a leaf. We thought perhaps we had the wrong address. We came to find out later, the house was actually the parents of the assistant coach, and he lived in an apartment in the back of the house. We were lucky his father didn't shoot first and ask questions later. As is typical of small towns, the news of this spread quickly and fortunately was something many were laughing about by game time. My heart aches today, not only for the people of Paris, but for the world we live in. A world that has gone mad. There seems to be no end to the senseless acts of violence perpetrated against innocent people. Over 120 people lost their lives, simply because they went out to enjoy living them. They were doing the things we all do on any given day, without giving it a second thought. They had no agendas or motives; they simply wanted to watch a concert, go shopping, catch a soccer match, or enjoy drinks and a meal. It is so difficult to understand the kind of hatred and extremism that would cut these lives short. It is also frightening to know this could happen at any time, at any place, any where in the world. It is crazy this is still happening in this day and age. Why does it continue to matter what color a person's skin is, what faith they believe in, who they choose to love, what gender they choose to identify with? We are all human. We all breath, we have jobs, we have families. We live, we love, we hurt. How hard is it, really, to respect someone whether you agree with them or not? Would anyone out there truly want to change a world full of diversity? I wouldn't want to live in a world where everyone believes in the same thing and looks the same way. I would find that so boring! People have stories; we can learn from each other, laugh with each other, cry with each other. A rose is just as beautiful as a lily, or an orchid, or any other type of flower. Think of how much beauty we would be missing if all we ever saw was the rose. Every life in the world has meaning. Every life in the world matters. These are my thoughts, personal stories, and personal opinions. Often triggered by something that transpires throughout the course of a day.